Parkcrest and Chaffey-Burke Schools are celebrating Canada’s 150th birthday by completing an exciting project. This project involves recognizing the contributions of a group of iconic Canadian musicians, Gord Downie and the Tragically Hip. Their songs are all about Canadian identity and culture. Gord Downie is a Canadian hero. On Monday, June 19th, he was appointed to the Order of Canada for his work on Indigenous issues. Gord was recently diagnosed with brain cancer. Parkcrest and Chaffey-Burke sold t-shirts to raise money for cancer research on Gord’s behalf. Altogether both schools have raised over $700. Parkcrest and Chaffey-Burke Elementary also learned one of the HIP’s songs “Ahead by a Century”, which was videoed by the Burnaby Learning Technology team and has been submitted as our contribution to the “Canada 150th” event. The song was also performed by the grade two and three students at Primary Days of Music. Read more about our school on the national Canada150 project site. 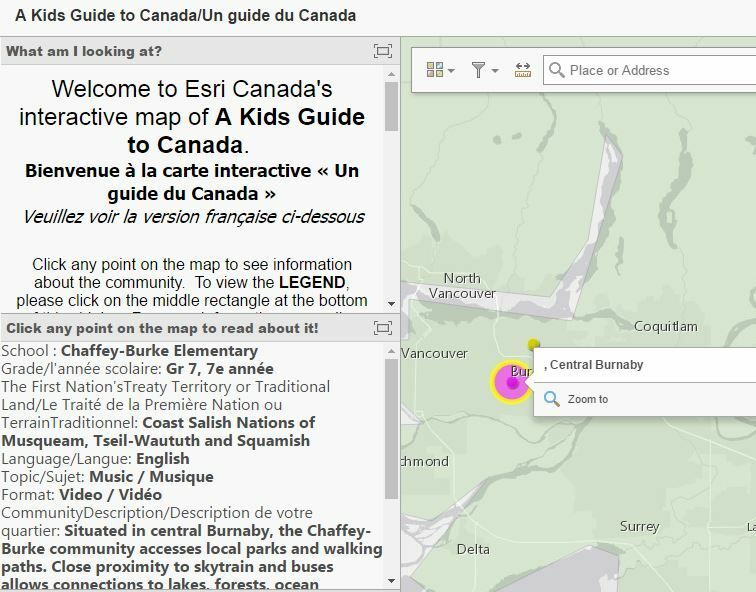 Click on the image to go to the interactive map of A Kids Guide to Canada/Un guide du Canada. Thank you for the freedoms, opportunities and choices we all receive from living in this great country of our!